Dull, straight, or barely-there eyelashes vanish with a couple swipes of this essential mascara. The formula is hypoallergenic, gluten-free, fragrance-free, and Ophthalmogist-tested. The wand is designed to curl and feather your lashes as you apply, and the formula—aside from being a perfectly pure and deep black—is made to give you volume without the clumping. 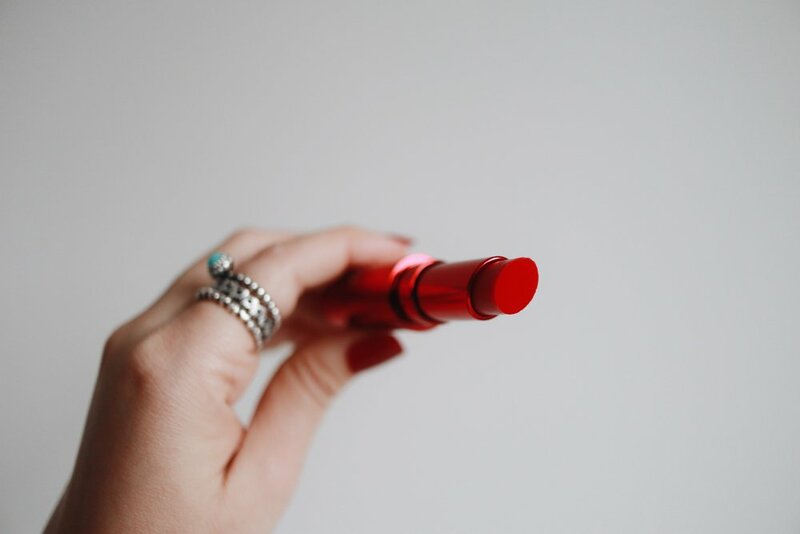 Pro-Tip: Run the closed tube of mascara under warm/hot water for a few minutes [or stick it in your bra while you do the rest of your makeup] to really loosen up the formula and ensure it glides on smoothly and clump-free]. Get it on Birchbox for $15. Full, perfectly-groomed brows are all the rage these days, but it can be difficult to achieve that look while wanting your brows to look as natural as possible. Enter tinted brow mascara. NYX’s version uses a brush similar to a mascara wand only shorter to give you more control. It comes in five shades (blonde/ash blonde, black, brunette, chocolate, and espresso) so you can get pretty close to your own color. The formula and brush combo are also designed to help your brow hairs stay put—and I’m confident the formula would last through a second Big Bang [my brows stay perfect long after the rest of my makeup fades away]. Plus, NYX’s Tinted Brow Mascara is easier to use and more natural-looking than an eyebrow pencil, so win-win! You can get any of the five shades on NYXcosmetics.com for $7.50 or any shade except black at Target for $4.89. I cannot say enough good things about this lipstick. It’s under $5, comes in 16 different and equally gorgeous matte shades [plus 9 super-cool metallic shades], and is perfectly pigmented. The formula isn’t too drying, and lasts through a fair amount of eating and drinking—I wore this to an outdoor wedding [on a 90+ degrees summer day] and had to reapply once over the course of the day [12-ish hours]. The wand is designed to give you the ultimate level of control and handling power and you don’t need a zillion coats for the pigment to show. Pro-Tip: If you’re worried about the color bleeding, or just want the color to last forever, line your lips with the same color lipliner and fill them in with the same liner to make your pout last and last! Get the matte shades at Ulta for $4.99, and the metallic shades on WetnWildbeauty.com for $4.99 [on sale right now for $2.49!]. Let me start off by saying that I am definitely not a makeup guru. Until I found this product, I’d resigned myself to just never wearing eyeliner. This “eye marker” uses a skinny, felt tip that gives you crisp, clean lines every time. The formula is richly pigmented, phthalate-free, paraben-free, aluminum-free, and cruelty-free. It’s perfect for giving beginners control and confidence and makeup pros the power to easily create the perfect wings and cat eyes. Get it at Target for $7.49. These wipes are perfect for those nights where you're too tired to drag yourself to the bathroom to actually wash your face. The micellar water works really well to break down makeup and clean out your pores—plus, they leave your son baby soft! The wipes themselves are made from recycled cotton, so there's basically no downside! Pro-Tip: Leave a package of these wipes next to your bed so there's no excuse for not cleaning all the gunk off your face before going to sleep! This leave-in conditioning cream from Garnier Fructis is a lifesaver on humid days. The paraben-free formula is made of Vitamins B3 and B6, citrus and apricot proteins, and Moroccan Argan oil, and penetrates the hair to keep your locks smooth and resistant to frizz. A small amount goes a long way, and it leaves your hair smelling like a tropical paradise. Get a bottle from Amazon for $2.99.